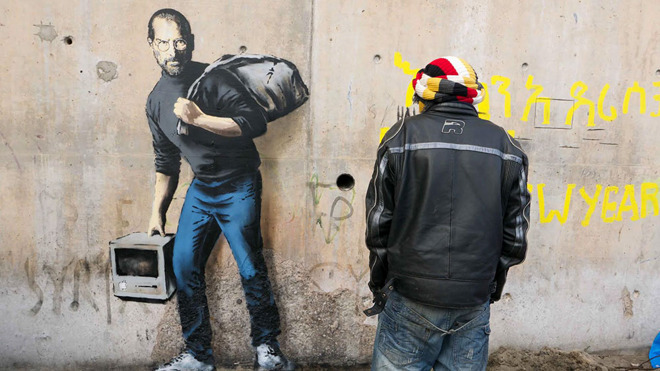 International street artist Banksy has been credited with a new mural at the "Jungle" refugee camp in the coastal city of Calais, France, drawing attention to the fact that Apple co-founder Steve Jobs had Syrian roots. The image depicts Jobs in his signature jeans and black turtleneck, carrying an original Macintosh in one hand and a bag over his shoulder. 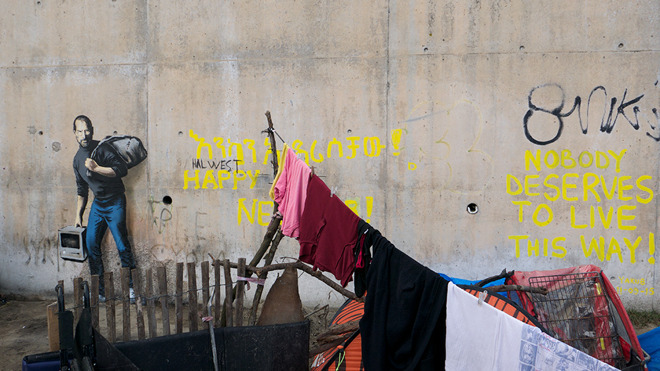 The image is surrounded by the tents of real refugees hoping to cross the English Channel get into the U.K., many of whom are believed to be fleeing Syria's civil war. Jobs' biological father, Abdulfattah Jandali, was raised in Homs, Syria and came to the U.S. to pursue a PhD. There he met and fathered Jobs with Joanne Schieble, but Schieble's own father refused to let her marry a Muslim, eventually prompting her to give Jobs up for adoption to his namesake family. "Apple..pays over $7 billion/yr in taxes - and it only exists because they allowed in a young man from Homs," Guru-Murthy quoted Banksy as saying. Anti-immigration sentiment has been on the rise in Europe and the U.S. throughout 2015, but surged in the wake of last month's terrorist attacks in Paris. A passport briefly linked one of the attackers to Syria, until it was discovered that the document was faked. Regardless, a number of right-leaning Western politicians have argued for restricting or cutting off the flow of Middle Eastern immigrants. One U.S. presidential candidate, Jeb Bush, has suggested only allowing Christian Syrians into the country, while another —Donald Trump —has proposed banning any Muslim from entering the U.S.